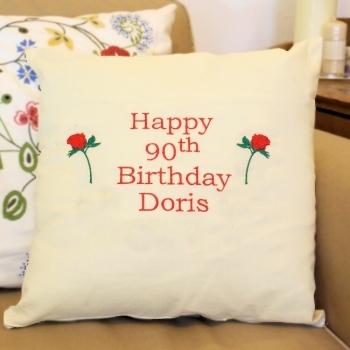 Approx 41cm or 16 inch square 100% cotton cushion cover with fill, in your choice of cushion colour. Select the font style you prefer. Enter a name, nickname, house name or little message ie; Happy Birthday. Our sample is shown in Print style lettering, you can choose from the options the style you prefer.